Mr. Rush is a home theater enthusiast from Phoenix, Arizona (USA), who built a dedicated media room built as an extension to his home in 2008. Mr. Rush had a technical background in electrical engineering and had spent many hours reading websites and papers, as well as taking measurements of this room acoustics using Room EQ Wizard and TrueRTA. Like many enthusiasts, even those with a technical background, Mr. 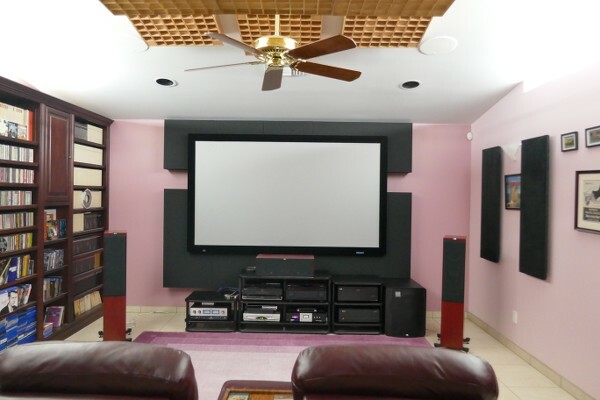 Rush realized that acoustics and Dolby Atmos speaker placement is a complex field, and had struggled with formulating an improvement plan for this home theater. That’s when he reached out to the professionals at Acoustic Frontiers, who work day in and day out in this field, and posses the technical background and expertise to improve home theaters. This project involved multiple phases from late 2015 through the middle of 2017. The client’s main objectives were to improve the room acoustics and add speakers for Dolby Atmos. The client’s equipment included Phase Tech speakers, SVS and Phase Tech subwoofers and a Marantz pre-pro. Phase 1 of the project started with Home Theater Layout work to alter the surround speaker placement to support Dolby Atmos. Historically, in 5.1/7.1 channel systems, the surrounds and rears were placed high on the wall in order to generate increased envelopment and reduce localization. Dipole surround speakers, which exhibit an on-axis null, were often used to further reduce localization. This all changed with the advent of Dolby Atmos for the home in 2015, though even before this film surround mixers had begun to use the surround speakers for sounds that were intended to be localized. 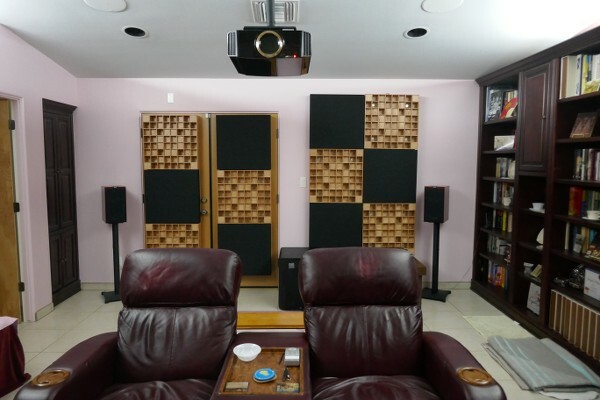 There are many nuances to Dolby Atmos speaker placement (here’s a blog on the subject), but two key considerations are a) the angular separation of the surrounds/rears to the top speakers and b) the speaker coverage pattern / dispersion. For Mr. Rush’s project, we specified changes to surround speaker types – from dipoles to monopoles – and changes in the surround speaker locations, as well as defining the best placement of the top speakers to align with existing ceiling can lights. We provided a fully timbre matched set of KEF speakers to Mr. Rush, including the R700 for the left/rights, R600c for center, R300 for surrounds and the in-ceiling CI-200RR-THX for the tops. The mis-matched subs were replaced with two SVS PB-2000s. A Yamaha CX-A5100 replaced the Marantz to provide Atmos processing. In phase 2, we performed a Room Acoustic Analysis followed by Acoustic Treatment Design. A number of issues were found in the analysis, including slowly decaying room mode resonances and strong reflections from the ceiling and rear wall. We were a little limited on what we could do due to the wall-to-wall bookshelf along the left side wall. However, our plan incorporated tuned bass trapping on the front wall – RPG Modex Modules – coupled with RPG Omnifussor diffusors on the ceiling and rear wall. The projection screen would be mounted over the front wall treatments. We also re-used some of Mr. Rush’s existing acoustic treatment on the ceiling. Phase 3 was the system calibration. This was done remotely over the internet and included placement and integration of the front and rear subwoofers and set up of equalization in a miniDSP 2×4 processor. We think the acoustic treatments added improved the overall look of the theater, in addition to their benefit in fixing the room’s acoustic issues and improving sound quality. 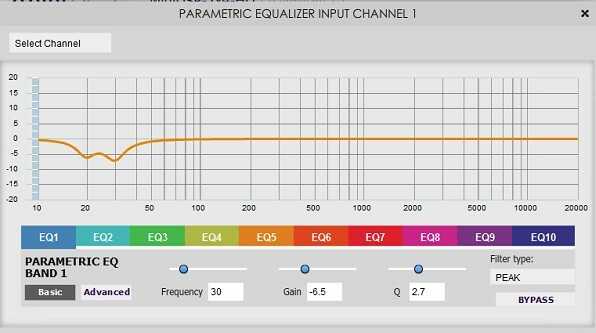 Post calibration measurements reveal a superbly flat center/sub combined response, showing the benefits of a multi-tiered approach to improving sound quality. Acoustic treatments, carefully placed subwoofers and equalization all play their part in the final result. 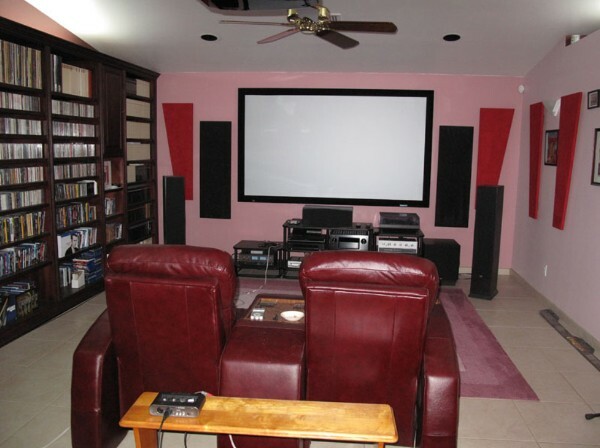 “Around 2005 we were doing some remodeling on our house and decided to add a media room. This was going to be a simple room with a wall of book cases for books, CDs and DVDs, a TV and speakers. About this time HD DVD and Blu-ray discs started to appear and the TV became a projector and the speakers became a 7.1 system with a couple of mismatched subs. I also installed a home theater acoustic panel kit. This was working OK. In 2012 we toured Dolby Labs in Burbank and learned about Atmos and we were able to hear some movies in their theater and realized our setup was lacking. 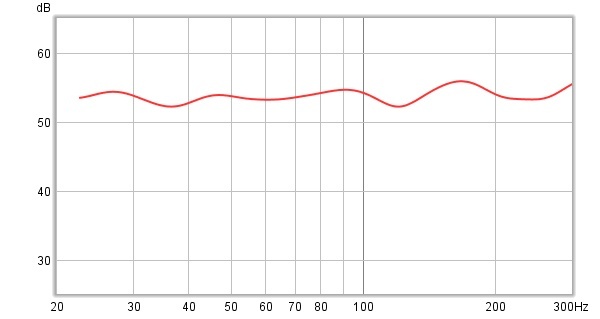 I acquired some software and a microphone and started making measurements. I discovered it’s easy to make a lot of measurements but it’s not easy to interpret them and decide what to do. I wanted to add ceiling speakers for Atmos and improve the acoustics. I needed some help. I searched the internet and found some helpful articles and the Acoustic Frontiers website. 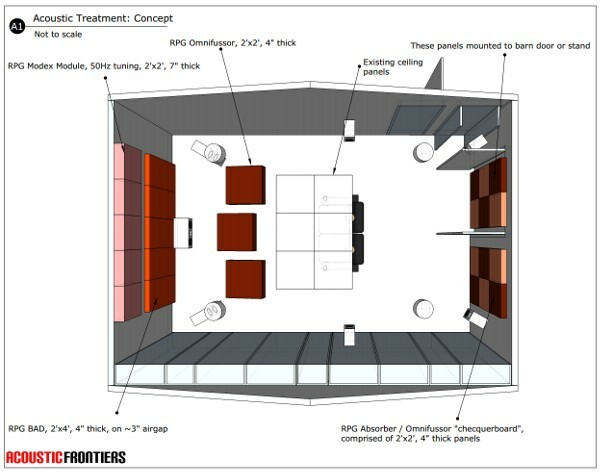 Unlike many websites, the Acoustic Frontiers website had a lot of information about acoustics, what products and services they offer and a detailed description of the process. I sent an email to Acoustic Frontiers and Nyal Mellor responded immediately. We discussed my goals and started on a plan. First, we decided on replacement speakers and the additional speakers for the ceiling. I also needed a new pre-processor to support the additional channels. 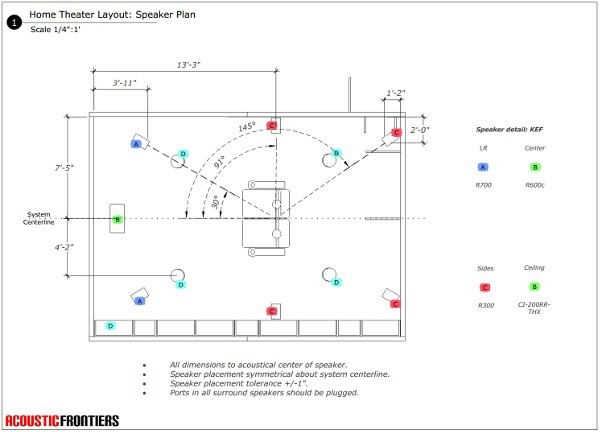 Nyal was very helpful in selecting the components and provided detailed placement drawings for the speakers. I installed the new speakers and Nyal setup a remote login to my computer and we were able to make measurements and integrate the subs. This worked very well and provided a big improvement in the sound. For the next step I took measurements of the room acoustics and sent them to Nyal for analysis. Nyal provided a detailed report and we discussed acoustic treatment options. I installed the recommended panels and we adjusted the sub setup and did some minor EQ adjustments. The sound is much improved from the original configuration. “Angular separation of the surrounds/rears to the top speakers” are you talking about the horizontal or vertical plane from side speakers to overhead speakers? 3D space is how you perceive it as you are in the room, rather than the distorted view you get if you simplify to a side on projection like Dolby Atmos does in their guidance.